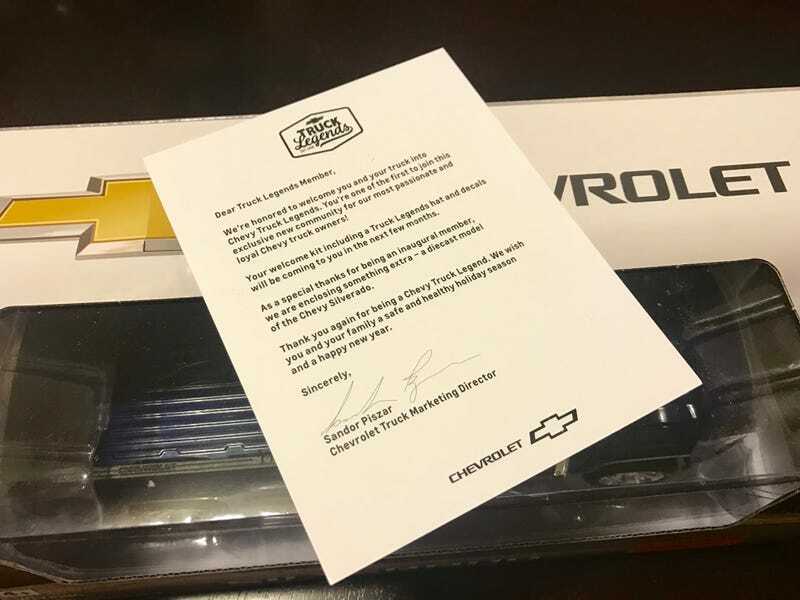 I signed up for the Chevy Truck Legends program in September and I was supposed to receive a hat and decal in 6-8 weeks. 3+ months later I got this instead. I’ll take it. I’m not a big scale collector but this is still pretty neat (and maybe trade bait for the right Corvette). It’s a Norscot-brand 1:24 scale 2014 Chevrolet Silverado. Really looks like the kind of thing you’d find on a shelf in a dealership service department. It’s on the cheap end (about on par with Maisto, I think) but it has some heft and the exterior is nicely detailed. The front doors, hood and tailgate all open, though the engine bay and interior aren’t even really Maisto-level detailed. The rear windows are also strangely dark. The rear bench seat is molded plastic just like the rest of the interior but the windows are so “tinted” that you can’t see them without direct light. But listen to me grumble about a free model. Free and one that has a unique story how I ended up with it! On another note, I finally found time to go to Target and lucked into finding the Redliners Corvette. It was the only one on the rack and another collector was poking through main lines. I grabbed it and took off. The card is so beautiful, I’m still trying to decide if I’m going to DLM or not.